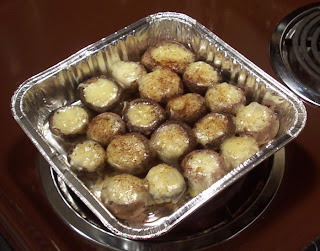 For Thanksgiving Eve I made some marinated and cheese stuffed mushrooms. I almost made either marinated or cheese stuffed mushrooms, but I decided to combine my recipes and see how they turned out. I enjoyed them! Simmer ingredients and then add mushrooms (remember to remove the stalk). Bring to a boil for a few minutes. Allow to cool and store overnight in the refrigerator. After the mushrooms have been in the marinade overnight, remove and place in a pan or on a cookie sheet. I placed them snugly in a pan so they wouldn't slide around. Stuff with your choice of cheese. I chose brie because it is soft and easy to ball up to fit right inside the mushroom. Place in oven on a moderate temperature (350-ish) for about 20 minutes. Optional: garnish with paprika, or use chili powder by accident like I did (hey, they are the same color). I LOVE ordering this dish at restaurants so I'll have to give this a try. They already look delish!! !